as relevant to the McQuat family history. This brief history is intended as a background to the McQuat family history. It therefore concentrates on items considered relevant, and should not be regarded as a comprehensive history of the town or district. Euchan Water rises high in the hills and flows down to join the River Nith at Sanquhar. 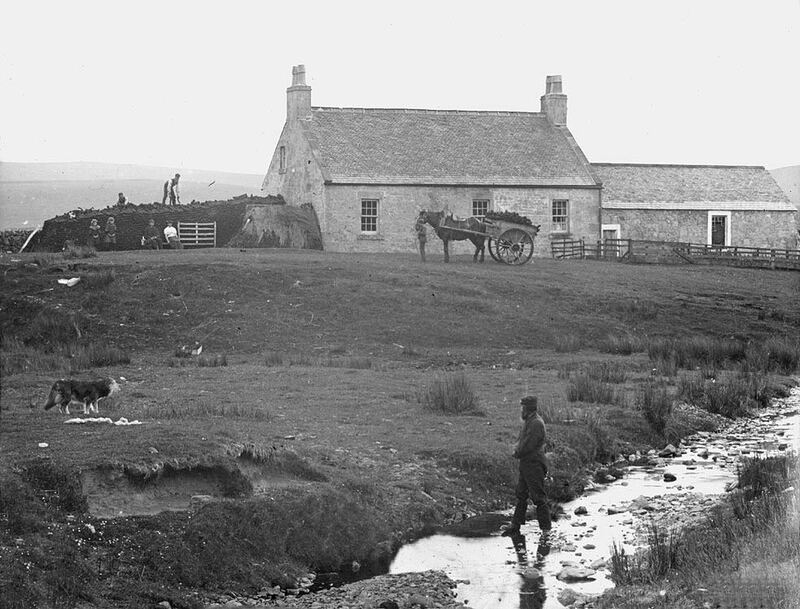 Its waters support a number of farms, of subtantial size near Sanquhar and becoming smaller and poorer further upstream. 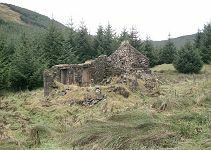 The most remote of these farmsteads was Euchan Head, about 7 miles southwest of Sanquhar and now lying derelict under forest planted since the 1970s. 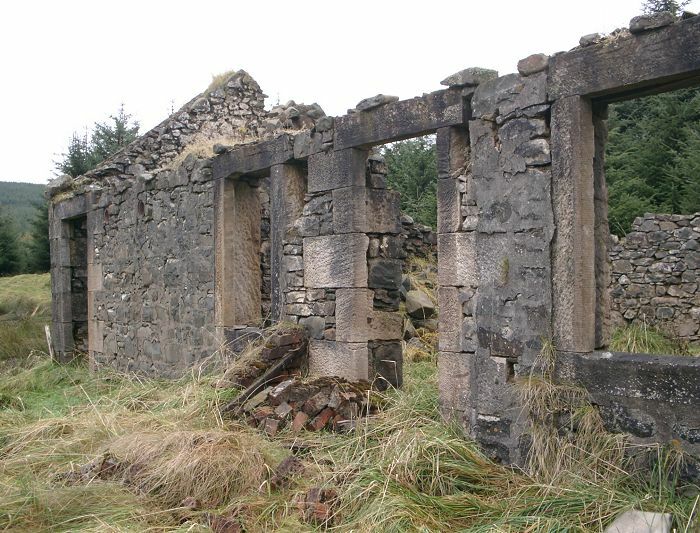 The farm building is still shown on the current OS map at grid reference NS 684059, and the following pictures were taken during a visit to the site in October 2003. 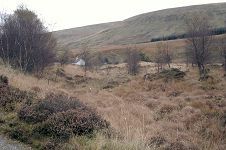 View down Euchan Water over the cottage of Euchan Bank, about 5m from Sanquhar. The remains of the cottage at Euchan Head, now surrounded by recent afforestation. 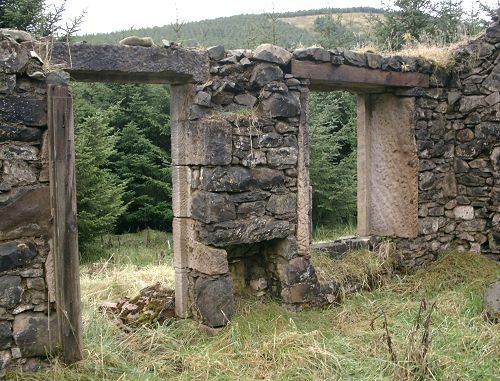 The front of the cottage, showing the substantial stone window frames. From inside the main room, looking through the front door and down to the river. 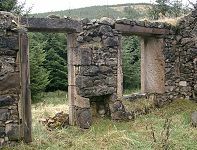 Penbreck is a remote location in the hills 8 miles east of Cumnock, and south of Muirkirk. The site of the 3-room house at Penbreck is found on OS Map 1:50,000 series sheet 71, grid reference NS 723194, near the junction of Poldive Burn and Auchtitench Lane. (Lane is another local name for a stream). The 1976 edition of the map marks the house, with the surrounding area covered with forestry. Fortuitously, an early photograph of the Penbreck farmstead has survived in the private collection of a Muirkirk printer, and appears on the Muirkirk town web site. A copy is reproduced below.